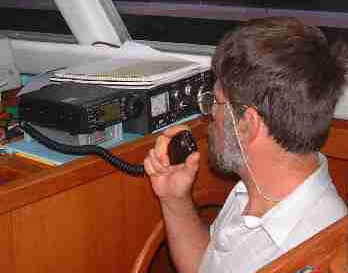 The standard piece of communication equipment on a boat is the marine VHF radio. This is a line-of-sight 25 watt two-way radio, with specific channels. 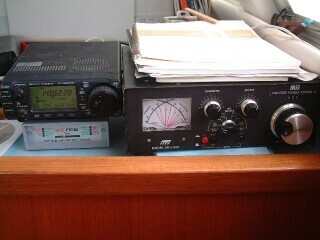 All yachts have these, although some radios have more functions than others. The one that came with Ocelot was old and used a battered antenna wire. We brought a new one with more features and a more useful design. We also dropped a new antenna wire, inside the protection of the mast. This considerably improved our radio's quality. Many boats, including Ocelot, also have a handheld VHF. These can be used as backups if boat power fails, for ship-to-shore communication, and any other situation that requires communication by VHF. The problem with using marine VHF radios is that everybody has them and uses them, and they are only supposed to be used for marine purposes. Also, they aren't too cheap. Our family also has four handheld two-way 'family' radios. They aren't as good as the marine radios, and are still only line-of-sight, but they work. They are generally more private, and can be legally used for any purpose. One thing that is common on charter boats (as Ocelot used to be) is a cell phone. These phones work like car phones, in that they use the ship's power and an external antenna. Unfortunately, cell phones need to have line-of-sight to a cell antenna, and so they only work close to shore. There aren't any cells on the ocean, but the antennas are usually placed at high elevations, and the boat's antenna can be mounted on the mast. Ocelot is rigged for such a phone, and we have the antenna and a phone we could use, but they aren't connected and we are not (as yet) paying for the service. The other problem with these phones is that, like normal cell phones, they can only be used in some areas. If we find a service that we can use a lot, we may decide it is worth the cost. We also have an Iridium© satellite telephone. This is used much like a cell phone, but relays through satellites in orbit. These satellites track incoming calls and route them to the correct phone. Similarly, they track outgoing calls and relay them to a groundside station or another Iridium© phone. These satellites allow easy communication anywhere in the world. Calling to or from an Iridium© phone is expensive, but only for the caller. Iridium phones can also be used for Internet data transfer or to receive free text messages. Unfortunately, they don't have very good Internet connection speeds and are quite expensive, so we don't use ours with the computers. The last method of long-distance communication that we have onboard is our HAM radio set. The HAM radio has several advantages. First off, it is free to use. Second, it can reach almost anywhere on earth. Third, it can be used for slow e-mail transfer, weather fax, or patched into the landside telephone system. However, HAM systems require a good grounding and a long antenna for HF (world-wide) communications. We are using our engine block, which connects to the propellers, for a ground (we have a specially designed plate mounted under our hull that would work much better, but it isn't connected yet.) Ideally, you want maximum surface area underwater for a good ground. See also my father's Radio E-mail page, and my Contact Information page.